Let us service your Web, Intranet and Print Media design needs. Our years of experience, personalized service and attention to your needs mean we can guarantee you'll be happy with our work. Over the years our business has grown in many directions. Newsletter Design, Database Management and application-related Consulting and Training Programs have expanded to include Audio/Video Production, Database, Network and Website Design and a wide variety of Internet Marketing Strategies. Our Pricing is among the most competitive in the industry. We are a small company and still trying to make our mark so prices are being held down as we grow our business. Take advantage of this limited timeframe and contact us for pricing on all your design needs. Uniquely positioned to give you integrated design, state of the art technology and marketing knowhow, PCIS makes sure we understand you, your target audience,competition and website and product/service needs before we begin our design. "The Customer is Always Right" - but ONLY AFTER they have the information needed to make decisions. Personalized Computer & Internet Services helps you help yourself! Samples of our Websites, below, include links to the sites themselves. Feel free to take a look or even contact the site owner for information about our services. This Official site for the home owners association of Waiela Ekahi Village on Maui is easily navigated and used extensively by the owners and office staff of the homeowner's association. Owners find sections on Governing Documents including Alterations manual, Before you Rent with info on rental procedures, online updates of guest info, etc to be very helpful. Much more info and back end for office staff that coordinates owner and unit info for many applications. Maps, site plans and floor plans viewable on-line or in downloadable PDF format very useful. The password protected Owners Section allows the owners to efficiently update their contact information, view newsletters, board minutes, an AOAO calendar, and participate in polls. This a PHP scripted customized section. To increase on-line credibility and search engine relevance, we convinced her to enlarge the scope of her site and include more photos of the condo and comments on what to expect from a vacation in Ekahi 5B or 42E. Search for Wailea Ekahi Village or Wailea condo in most any search engine - this site is usually in the top 10 results. 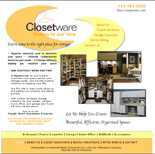 This growing closet design and installation company wanted to create a professional but friendly image as they attempted to expand their Closet Classics authorized dealership to encompass more custom storage systems and solutions. To increase on-line credibility, search engine relevance and usability, we cleaned up the logo, enlarged the scope of the site by showing actual product and design tools and included text links to specialized closets for easy navigating on each page. Attention to detail, whether it is how a site is used by its public or researching the category to determine search phrase optimization, is a priority for us. At Personalized Computer & Internet Services we offer complete Newsletter, Brochure, Pamphlet and Business Card Design. We can also combine with our Alliance Partners to offer Post Cards, Sticky Notes, Note Pads and many other items. Whether you're starting from scratch, want an update or just a professional touch - we can deliver! Our total, "start-to-finish" service includes your input and any or all of the following services. - Let us help you help yourself!